Preparation 1 – Put the sliced pepper, chilli, spring onions, garlic and ginger in a small bowl. Preparation 2 – In a small bowl, mix together the vinegar, soy sauce, sweet chilli sauce and ketchup and add 2 tbsp water. Preparation 3 – Place some kitchen roll sheets on a plate. Place the beef strips in a bowl and sprinkle over the corn flour and five spice. Mix until coated. Heat the oil in a wok or frying pan until very hot. Add the beef and fry until golden and crisp. Place on the kitchen roll. Drain away all but 1 tbsp of the oil. Add the pepper mixture and stir-fry for 3 minutes to soften, but don’t let the ginger and garlic burn. Pour the sauce over the stir-fry veg and bubble for 2 minutes. Return the beef to the pan and make sure it is well coated. This is very tasty and fragrant and so easy to cook if you prepare the veg and sauce. 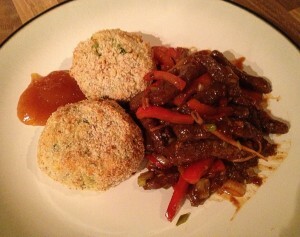 I served this with the Potato and Coriander Cakes and a little mango chutney.